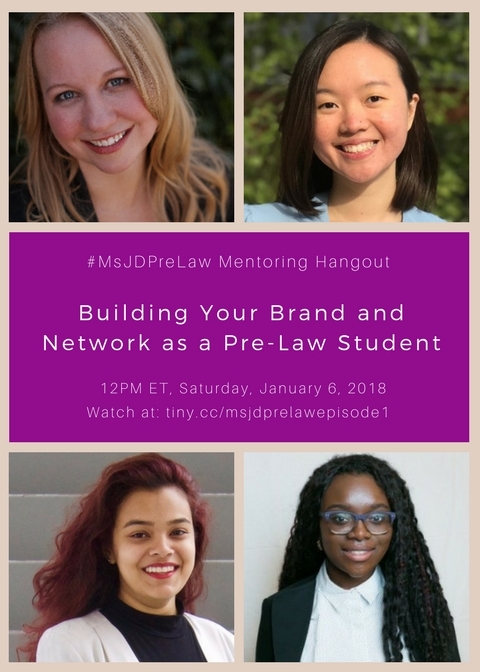 Building your Brand and Network as a Pre-Law Student - #MsJDPreLaw Mentoring Hangout (Ep. 01) | Blog | Ms. JD | Determined to Rise. The Ms. JD Pre-Law Program is excited to launch the #MsJDPreLaw Mentoring Hangouts, a series of conversations between attorneys and pre-law students! Our first episode, on "building your brand and network as a pre-law student," will be streamed live at 12pm ET on Saturday, January 6, 2017, at tiny.cc/msjdprelawepisode1.